Try this simple recipe of you are not sure about them yet! Warm a large skillet over medium heat. Drizzle the hot skillet with olive oil and add the Brussels sprouts. Add the kosher salt and pepper to taste. Cook for about 10 minutes stirring frequently. When they are mostly browned remove from the heat. Transfer them in a bowl and set to the side. Warm a smaller skillet over medium heat. Drizzle with olive oil. Add the minced garlic and cook for 1-2 minutes. Don’t let it brown! Immediately remove from heat and spoon garlic into a small bowl. Add the extra virgin olive oil. Squeeze the lemon to juice it and combine with the garlic. Whisk together for 3 min. Pour the vinaigrette over the Brussels sprouts and toss to coat. 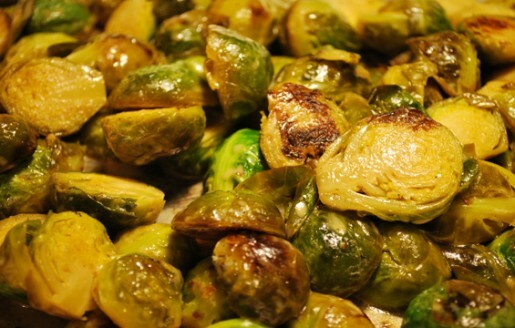 We LOVE brussels sprouts done this way, or in the oven to avoid any splatter. YUM! YUM! YUM! I personally slice mine on a mandoline. The ones my store has are almost true baby cabbages. It takes a little longer but they’re a little easier to entice the Hubby. You seriously read my mind. I have only just recently discovered the wonders of Brussels Sprouts. Just the quick and simple recipe I was looking for!